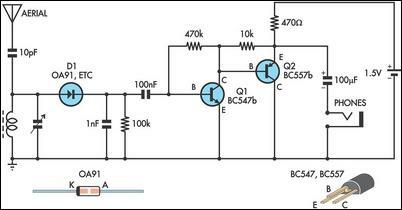 This circuit is essentially an amplified crystal set. The inductor could be a standard AM radio ferrite rod antenna while the tuning capacitor is a variable plastic dielectric gang, intended for small AM radios. The aerial tuned circuit feeds diode D1 which functions as the detector. A germanium type is far preferable to a silicon signal diode because its lower forward voltage enables it to work with smaller signals. The detected signal from the diode is filtered to remove RF and the recovered audio is fed to a 2-transistor stage which drives a set of 32O phones from a Walkman-style player.